Who invented Clothes? The name of a specific person has never been credited with the invention of Clothes. The invention of Clothes is so old that the name of the inventor has been lost over time, although the first use of Clothes are believed to have originated c.10,000 BC when evidence of the first known use of clothes date back to the Neolithic Period of invention(10,200 - 3000 BC). Why were clothes invented? Clothes were invented by prehistoric man to provide protection from the elements such as cold winds and from rain, sleet and snow. The first clothes were made in colder climates from natural elements such as animal hides (leathers) and furs, grasses and leaves. 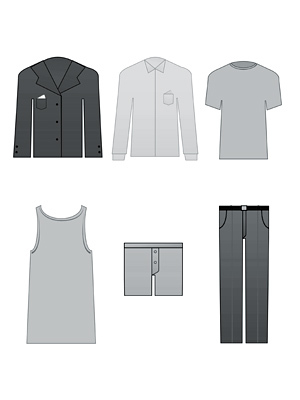 Definition of Clothes: Clothes are defined as a covering of articles of dress or garments, such as dresses, shirts, pants and coats, designed to be worn on a person's body. Fact 1: Who invented Clothes? The name of the inventor of Clothes are unknown but it is believed to have been invented in c.10,000 BC during the Neolithic Period of inventions (10,200 - 3000 BC). Fact 2: Who invented Clothes? The earliest forms of clothing were simply draped around the body and occasionally fastened with pieces of bone. The natural resources and materials available in specific regions were used to make clothes from animal and plant products. Fact 3: Who invented Clothes? Clothing became more sophisticated when sewing needles of bone were invented. Evidence of early sewing needles, dating back to 30,000 BC have been found Kostenki, Russia. Clothes were stitched together with sinew, the tough, fibrous tissue that unites muscle to bone. Fact 4: Who invented Clothes? The animal products used to make clothing included the fur and skin of animals and even pelts of birds. Various methods of tanning the skins were developed to make soft leather enabling different designs and styles of clothing to be invented. Fact 5: Who invented Clothes? To soften the leather required for clothing the fur was first removed and various processes were applied such as scraping, smoking, softening, stretching to achieve soft, pliable leather. The leather was smoked to seal the fibers of the hide. The wood used during the smoking process determined the color of the leather. Fact 6: Who invented Clothes? The leather was used to create various styles of clothing and as time passed it was discovered that natural resources could be used in order to make different colored dyes and pigments. Paints, dyes and pigments were dried and stored as a powder. The powders were mixed with liquids such as urine, egg yolks and animal fat to act as binders. Fact 7: Who invented Clothes? Red clays, berries, roots and barks produced red coloring. Kaolin clays, ground gypsum, limestone and shells produced white colorings. Black was made using charcoal and dark barks. Yellow, green and blue coloring could be obtained from flowers, berries, barks, seeds, plants, moss or algae. Fact 8: Who invented Clothes? The plant products used to make clothing were grasses or the bark of trees that were shredded to make fibers. Fact 9: Who invented Clothes? Approximately 12,000 years ago the process of weaving was discovered. Neolithic people had learnt to interlace twigs and small branches to create baskets and shelters and the process of weaving evolved. Fact 10: Who invented Clothes? Spinning describes the process of drawing out and then twisting plant or animal fibers to form yarn (a continuous strand or thread). Weaving developed by interlinking a set of vertical threads with a set of horizontal threads to produce cloth. Fact 11: Who invented Clothes? For thousands of years, fiber was spun by hand using simple tools, the spindle and the distaff. The spindle was a stick that had a notch in the top which was used to draw out natural fibres for spinning into thread. The distaff was the rod on which flax was wound prior to spinning. Fact 11: Who invented Clothes? The first primitive loom was invented for weaving yarn into a textile. It developed from using a branch of a tree to hang the warp (vertical threads) that were weighted down with rocks or other heavy items. A wooden frame was then used for this process and the loom was invented. Fact 12: Who invented Clothes? The invention of Silk was made by the Ancient Chinese c.4000 BC using the fiber produced by silkworms which was woven into a very beautiful, soft and smooth fabric known as silk. Fact 13: Who invented Clothes? c. 5000 BC the Ancient Egyptians discovered that linen could be made from the fibers of the flax plant. Flax fibres are among the longest and strongest of all natural fibres used by man and the Egyptians spun the flax fibers by using the spindle, the distaff and the loom. The Ancient Egyptians also invented the earliest form of spinning apparatus, known as the drop spindle. Fact 14: Who invented Clothes? The Babylonians of the land known as Mesopotamia were the first civilization to use sheep for their wool, rather than for food. Sheep were bred to produce superior fleeces and by the European Medieval period wool was used to make the majority of clothes for the peasants. Different wool weaving techniques were developed providing a vast variety of woollen fabrics. Fact 15: Who invented Clothes? The spinning wheel, a machine used to turn fiber into thread or yarn, was invented in India c.600AD and its use quickly spread to Europe. The spinning wheel replaced the earlier method of hand spinning with a spindle resulting in the increased production of cloth and clothes. Fact 16: Who invented Clothes? Spinning machinery, such as the Spinning Jenny invented by James Hargreaves in 1764, displaced the spinning wheel during the Industrial Revolution. Another important invention was the ﬂying shuttle loom that was invented by John Kay in 1733. Fact 17: Who invented Clothes? The invention of the Cotton Gin by Eli Whitney in 1793 automated the seed separation process and made cotton production more profitable and cotton clothes cheaper. New cotton spinning machinery was introduced into America in 1798 by Samuel Slater. Fact 18: Who invented Clothes? The American inventor Elias Howe (1819 - 1867) revolutionized the clothes industry when he invented the world's first practical Sewing Machine in 1846. Fact 19: Who invented Clothes? Jacob Davis and Levi Strauss casual, hard wearing denim trousers called "Jeans" in 1873 which are still one of the most popular types of clothes worn in the modern day. Fact 20: Who invented Clothes? The care of clothes was made much easier when with the invention of the Electric Iron in 1882 by the American inventor Henry W. Seeley The invention of Ironing Board followed in 1892 by the African-American inventor Sarah Boone. Fact 21: Who invented Clothes? Caresse Crosby (1891 - 1970) released women from wearing uncomfortable whalebone corsets when she invented the Bra in 1913. Fact 22: Who invented Clothes? The invention of the Zipper by Gideon Sundback (1880 - 1954) in 1913 made it quick and easy to fasten clothes. Prior to his invention clothes fasteners consisted of bone needles, buttons, laces, ties, leather girdles or belts and hooks. The next clothes fastener was George de Mestral who invented Velcro in 1948.
Who Invented Clothes? - Invention - Definition - Meaning - Famous - Innovation - Significant - Clothes History - Clothes Timeline - Development - Clothing and Apparel - First - Definition - Kids - Facts - Information - Clothes History - Clothes Timeline - Info - Who invented Clothes - Dates - When - Why - Impact - Purpose - Use - New - Old - Definition - Meaning - Awesome - Cool - Clothes History - Clothes Timeline - Who invented Clothes?